GoToMeeting is famous for its recording abilities. But you may frequently run into the problems of impossibility of playing GTM recordings on iPhone iPad or uploading to YouTube. This greatly attributes to the proprietary WMV video with incompatible G2M4 codec that only renders on GoToMeeting's own platform. So if you are eager to share GoToMeeting video on YouTube or play the recorded video on Apple or Android devices, you are suggested to convert GotoMeeting video to MP4 format first with a professional video converter. Actually, if you are still following the GotoMeeting Codec installation beforehand so that you can further proceed the standard WMV to MP4 conversion for your personal use, I have to say it's quite circuitous. The one-stop solution to transcode GoToMeeting video to mp4 can be achieved simply with the help of MacX Video Converter Pro. In the latest version V5.9.1, this application adds support for G2M4 codec, which means you can simply convert g2m4 codec video to MP4, FLV, AVI, WMV, MOV, MKV, etc with one click. Thus to play recordings from GoToMeeting on your iPhone, iPad, Samsung, HTC, WP8, edit GotoMeeting video in iMovie or upload it to YouTube, FaceBook, etc becomes a piece of cake. Convert GoToMeeting Recording Videos Now! Top video converter video to compress and convert G2M4 recording video to MP4 MOV MKV AVI, HEVC x265 or iPhone iPad Xbox PS4 Android with all quality in 1:1 ratio. 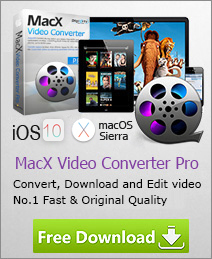 After free downloading the top video converter on your Mac , install and run it. Click "Add File" button to browse your computer hard disc and add the GoToMeeting recordings for conversion. Batch conversion is also supported, you can load several clips at one time. You can choose different formats for different files. Here we choose MP4 as output format from the format list. You can also choose to convert GoToMeeting recording to FLV, AVI, MOV, MKV, WMV and other mainstream format for playback or uploading. Tips: The "Edit" button on the main interface of this program is also available for you to trim your recordings, crop them to suit your device's screen, add watermark and even plug in SRT subtitle to MP4 video to make the GoToMeeting video understandable. Step 4: Start Transcoding GoToMeeting Video to MP4 . Click on the "RUN" button and the program will convert G2M4 codec video to MP4 for you in a few minutes. Then you can enjoy the recording on iPad, iPod, iPhone, Apple TV, Samsung, HTC, PSP, PS4, etc. Note: MacX Video Converter Pro supports encoding GoToMeeting video into streaming format like FLV or directly convert G2M4 codec video to YouTUbe for sharing online. Click the FLV video conversion guide to get your answer. Wanna convert MKV to MP4 on Mac (macOS Mojave included)? 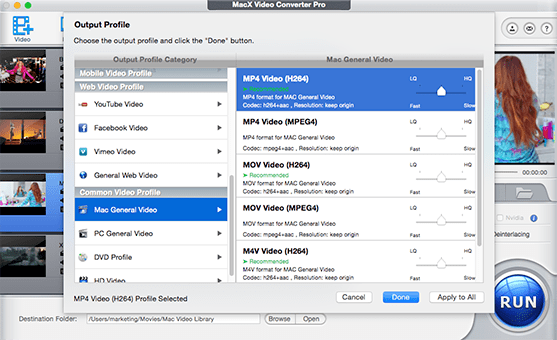 While stay on the page and you will get a good video converter for Mac OS X Mountain Lion, helping you convert MKV format to MP4 with ease. Wanna your convert camcorder video to MP4 format for playback on your iPhone, iPad, iPod, etc? Well, this tutorial will give you tips and tricks to convert your AVCHD video to MP4 format with ease. This tutorial introduces what are .wmv files and how to convert WMV to MP4, FLV, MOV, etc on Mac OS.